A few more. Passing place seems upside down since don't want someone thinking it's a bump. The speed camera and grit bin are not very good, I've made a few icons and those were the best I could make. The blue color of the water icons seems acceptable, I've made some changes to them to have more contrast and was getting worst. And the spring icon...well, weird icon but at least now is not similar to fountain icon. JOSM_icons_waypoints_and_waterways.png​ (16.0 KB) - added by zermes 3 years ago. JOSM_svg_icons_waypoints_and_waterways.7z​ (14.7 KB) - added by zermes 3 years ago. JOSM_svg_icons_waypoints_and_waterways_v2.7z​ (14.2 KB) - added by zermes 3 years ago. JOSM_icons_traffic_calming_v3.png​ (4.2 KB) - added by zermes 3 years ago. JOSM_svg_icons_waypoints_and_waterways_v3.7z​ (14.2 KB) - added by zermes 3 years ago. JOSM_svg_icons_waypoints_and_waterways_v4.7z​ (14.2 KB) - added by zermes 3 years ago. calming_combo.png​ (22.6 KB) - added by Klumbumbus 3 years ago. JOSM_icons_crossing_bump_hump.png​ (501 bytes) - added by zermes 3 years ago. JOSM_svg_icons_traffic_calming_bump_hump__CC0_Public_Domain.7z​ (1.5 KB) - added by zermes 3 years ago. Sorry, forgot to fix the viewBox code problem. Now it's fixed. Just a question, why did you choose yellow for most of the street icons? Because is easier if I use a color instead of black, white or grey to distinguish from the menu background color, usually in grey near to the white or near to the black (win,osx,linux...). For example, I changed to grey and now they haven't high contrast. So usually, in grey I put an halo like Don-vip suggested, but in this case the halo is much worst, so I hope the ones without the halo are acceptable (much better and simple when a color is used) as we can see in the next image. Note: I've attached the icons shown first in the next image and not the last ones with the halo, it's just to show them. This last file attached has all icons, including the ones I didn't changed this time. 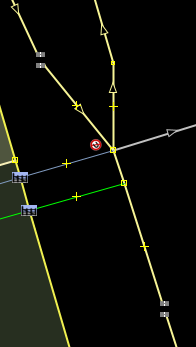 Forgot to change the color to grey also in Waypoints (menu icon) and Named Junction. I prefer to use the same icon for the preset menu and the mapview, so I copied traffic_calming.svg and crossing.svg to the no_dist folder, because they are not needed. Handle this in the Java code :) Don't touch the icons they're great! About crossing.svg the problem with this one is being obtrusive right? I can make one very similar but a bit better than the existing one. And thought "maybe they are some highway=crossing without crossing_ref or some other kind of information missing on them". Is it possible to somehow improve this, please? About crossing.svg the problem with this one is being obtrusive right? Rather that we already have specific svg crossing icons and the preset icon should be one of those for consistency. So there is no need for a different general crossing icon. Klumbumbus, it's just I can't see a crossing in that icon. I know not all crossing are zebras, but it's the most easily identifiable pattern. See the 2 examples. naoliv, what about the 2 last ones with bump and hump in grey? Klumbumbus, it's just I can't see a crossing in that icon. The grey ones look good. I don't know if I should say this: (more work to me and JOSM developers) should I try to create individual crossing icons like I did for traffic calming? At least for "Crossing type name (UK)" like pelican, tuffin, tiger, toucan and zebra. They could be shown in JOSM combo box with icons too. Don't know if in this case is a good idea, different icons all over the place...although would be nice to see exactly what type of crossing is. I just thought that it would be better to add an own preset for each traffic_calming type. With an additional group it doesn't add clutter to the waypoint group an it has the advantage that the Tags/Membership and Selection dialogs display the correct icon and prevents from using yes as value.